MK Nava Boker (Likud) responded on Thursday shortly after the military prosecutor in court dropped the murder charges against the IDF soldier who last Thursday shot a wounded Arab terrorist. "It is good that the military prosecutor dropped the murder clause," said Boker, welcoming the move. "After a week of an unprecedented uproar and criticism (against the soldier), it becomes clear that all those who accused the combat soldier of murder were wrong, and slandered him for nothing." 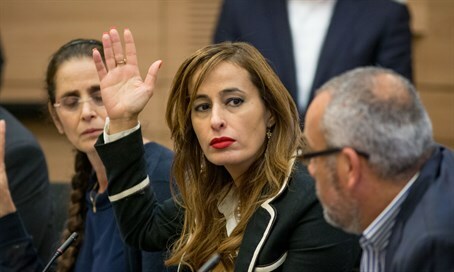 The MK continued, saying, "at a time when in the state of Israel there are those who choose to incite against the IDF and its soldiers, I choose to give backing to the combat soldiers in the field. Even if the soldier made a mistake in his judgement, he did not shoot an innocent, but rather a terrorist who tried to murder his comrade." "We have seen how an overwhelming majority of the public has taken the side of the soldier and I am happy for that, that testifies to the fact that the nation of Israel has a healthy sense of understanding reality." She concluded with a call for action, saying, "I again ask the president of the state and the attorney general to grant the soldier pardon. He fought for us, we must not abandon him now." While the murder charges have been dropped, the soldier remains under arrest on charges of manslaughter. He has testified that he shot the terrorist - who minutes earlier together with an accomplice stabbed and wounded a soldier - over concerns he was moving to detonate a bomb belt that was thought to be hidden under his unseasonably thick coat. That version of events was vindicated by a Magen David Adom (MDA) investigative committee.